The career of this fresh CSM MA Womenswear graduate is rapidly flourishing and showing no sign of slowing down. Movrin grew up the son of a butcher and whilst this may seem to hold little relevance in the context of his current day career, it is vital in understanding a little of his propensity for craftsmanship. From the tender age of eight he helped his father run the family’s butcher shop in the small city of Kočevje in southern Slovenia. He was trained in the trade, and being his father’s only son, the expectation was that he would, once old enough, take over the family business. But his involvement in the butcher shop was constantly counterbalanced by his fascination with fashion; from a young age, he became a regular visitor of Trieste, Italy, the nearest place to get the latest edition of Vogue. His fixation with fashion was further amplified when the Internet first arrived in the Movrin family home, allowing him to search the latest Dior campaigns. As it turned out, the skills that he had nurtured working with his hands as a butcher were surprisingly transferable when it came to working with fabric. Whilst a career in fashion was a far cry from his father’s idea of “a proper job,” he soon came to accept Peter’s decision to become a designer and has since become a huge source of support and encouragement. 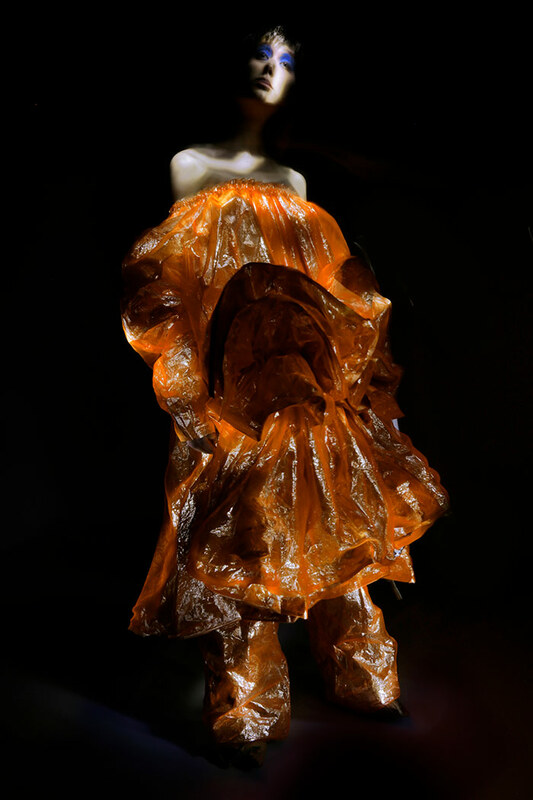 Prior to commencing the MA Fashion Womenswear at Central Saint Martins, Movrin had already had an illustrious career in education, having completed a BA in Textile Technology, a BA in Fashion and Textile Design as well as an MA in Fashion and Textile Design at the University of Ljubljana in his native Slovenia. Movrin was interviewed for the MA Fashion Womenswear by the late Professor Louise Wilson OBE, only one week before her passing, (he was offered a place on the spot). 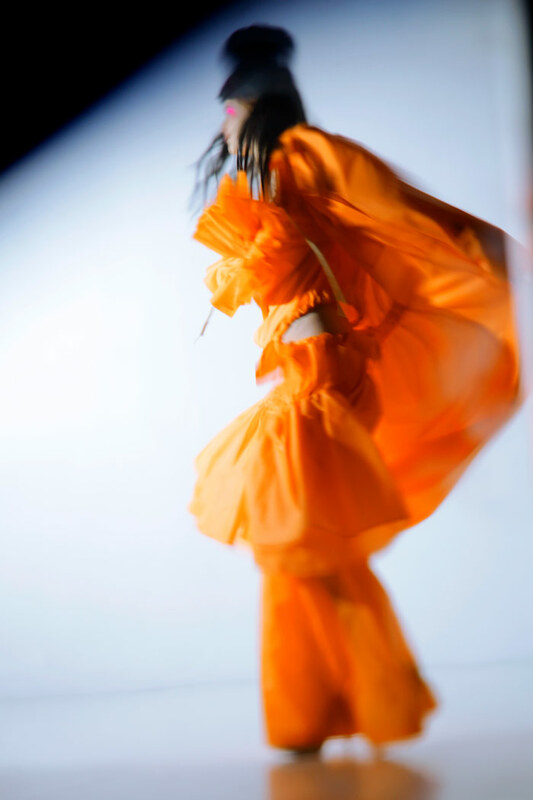 Having by this point already reached significant notoriety for his designs at home in Slovenia, he commenced the MA Fashion Womenswear Degree at CSM in 2015. Despite finishing the MA only earlier this year, Movrin is far from new to real-world design experience and high profile collaborations. His designs have transcended the runway, featuring both in film (The Hunger Games), and more recently, on stage, in the worldwide premiere of Antigone by Slavoj Žižek in Slovenia. 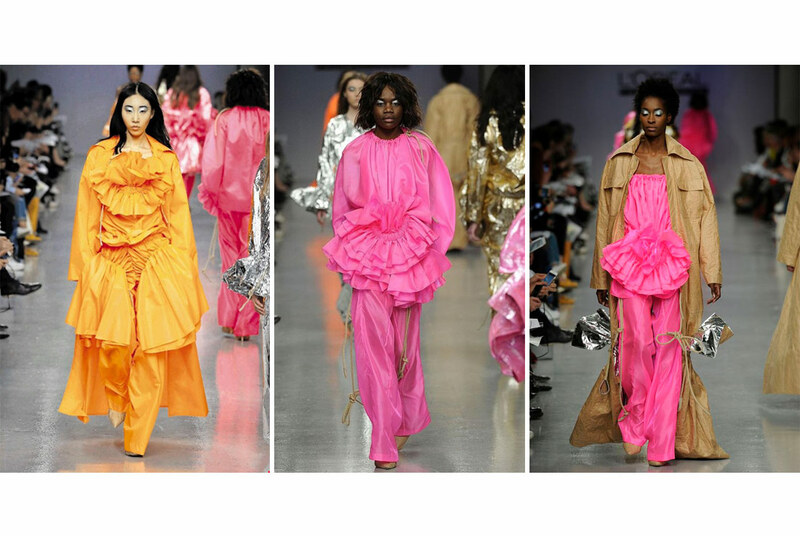 Björk, earlier this year, performed at Japan’s Fuji Rock Festival in a bright pink creation from Movrin’s MA collection, one of the latest additions to his ever-expanding list of accomplishments. The inspiration for Movrin’s MA collection came in the form of a small photograph that he had kept from the time when his family home in Slovenia was being reroofed. Construction workers had draped their hydrangea bushes with silver insulation foil ‒ the photograph depicted this scene. Movrin explained his continued meditation on this image, and on the contrast between the hydrangeas when fresh and pink, to the gradually decaying flowers when browning and dried out. Work wear details became a point of inspiration for the collection from the beginning, however, as the show neared, the inspiration for Movrin’s MA collection came in the form of a small photograph that he had kept from the time when his family home in Slovenia was being reroofed. Construction workers had draped their hydrangea bushes with silver insulation foil ‒ the photograph depicted this scene. A lasting memory from Movrin’s life at home in Slovenia is the perfumed scent of fabulous, older women in his hometown, the kind of glamorous, sartorially devoted lady that he aspires to dress now. Smell is incredibly nostalgic for the designer and is strongly connected to both his design process and his life more broadly. As such, a consideration during the inception of his MA collection was the desire to visualise the smell of Galop d’Hermès, his favourite perfume, in the form of his garments. At the beginning of January, just one month before the MA show, Movrin did a radical overhaul of the colour palette of his collection. Formerly consisting of blues, browns and greens, he became enamoured with a fabric on a trip to Shepherd’s Bush, which quickly became one of the key fabrics in his collection. 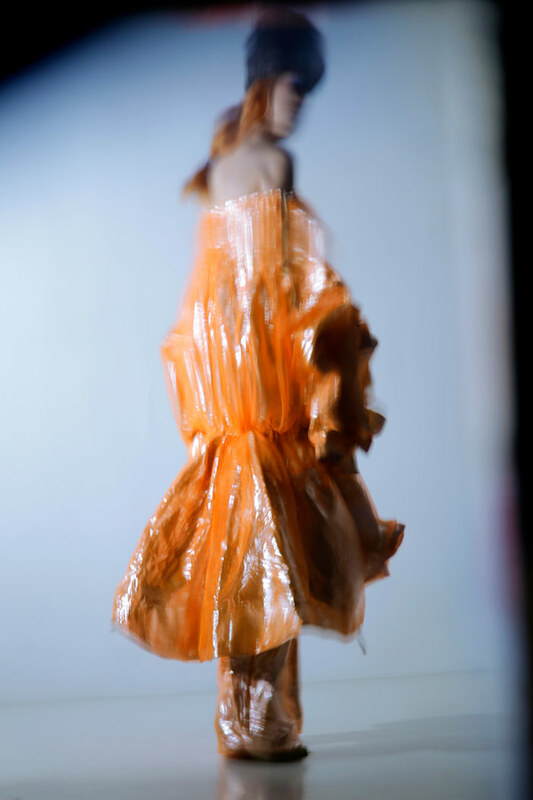 Butcher’s paper came next, also shortly becoming a central feature in his designs, positing a nostalgic connection between his childhood in Slovenia and his present-day life in London – a fusion of the past with the present and an intersection of the improbable. His designs were a platform through which to exercise his passion for material manipulation and craftsmanship. 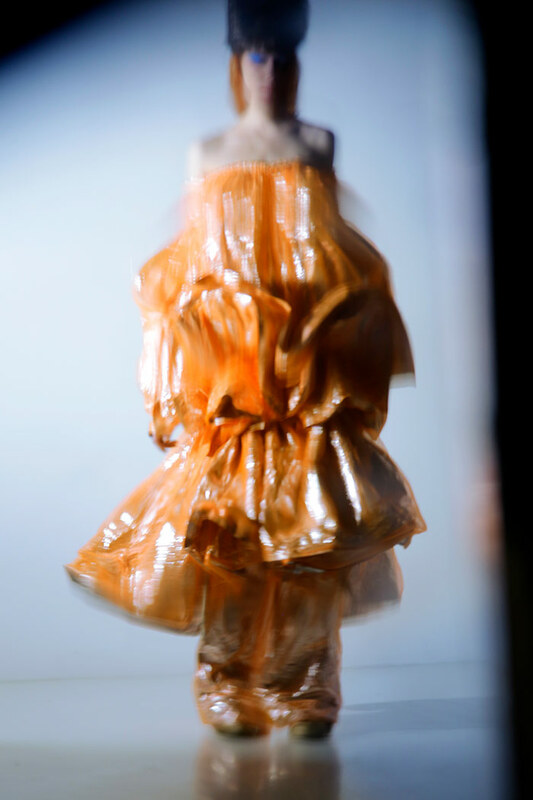 Inspired by the silhouettes of a couple of his favourite designers, Roberto Capucci and Mathilde Willink, Movrin set out to recreate ruffles in his own way, pioneering his own unique techniques and making many of his own textiles through what he describes as something resembling “manual labour” due to the level of material processes necessary to soften the fabrics. Movrin’s MA collection was a drastic departure from his past aesthetic, which tended towards monochromatic palettes and leather. 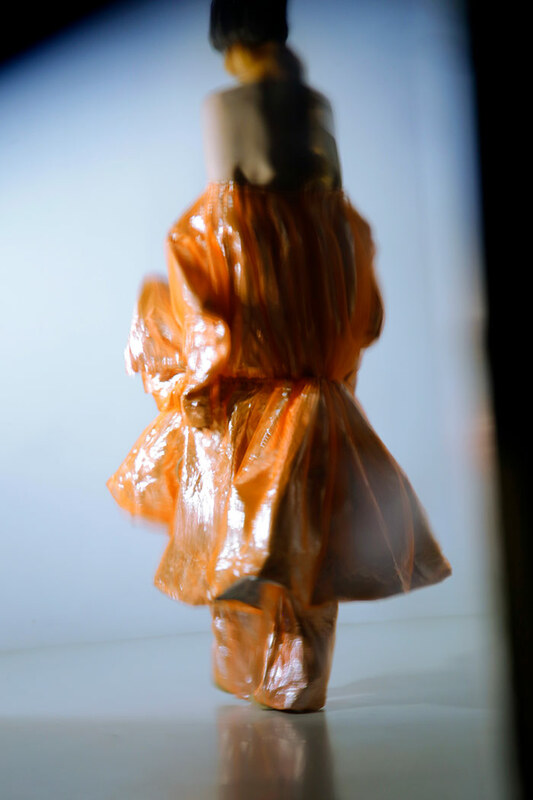 This time his garments were characterised by oversized silhouettes and abounding ruffles ruched with rope, fluorescent pink and orange, metallics and butcher’s paper trenches lined with silver foil. The pieces rustled as they came down the runway, heightening the exuberant spirit of the collection and bringing another dimension to his designs. Unlike many designers who spend the early stages of the design process visualising their creations through drawing, the inception of Movrin’s pieces typically occurs on the body, the interconnectedness of his creations and the human form therefore understandably very intimate. 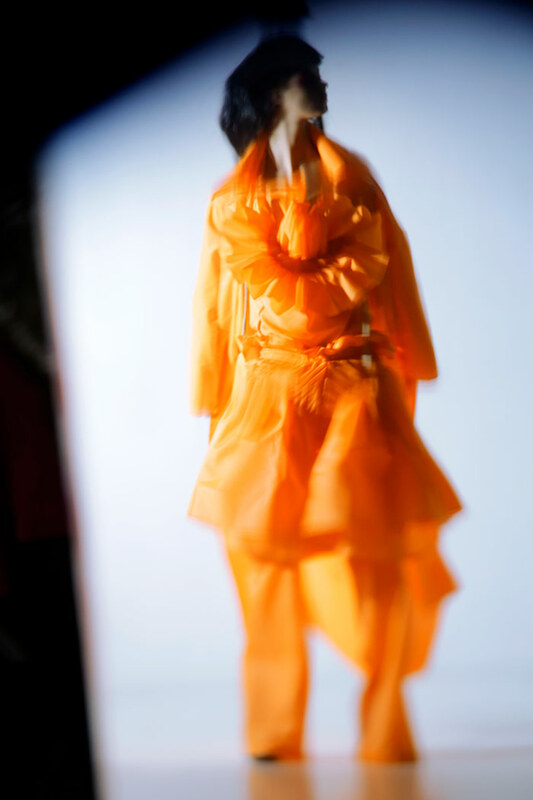 Working three-dimensionally is intuitive for the designer; he very quickly begins visualising his ideas on a mannequin in order to best get a sense of the way that a fabric moves, drapes, and interacts with the body. Movrin is not at all precious in his approach; he is perpetually layering, manipulating and cutting into everything he makes. As a material and process-oriented designer, Movrin’s initial inspiration for a collection generally comes in the form of a fabric, this being the necessary first step before deciding on the broader theme for his designs. As he explains, he always has something specific to say through the clothing he makes and aims to speak to that intention as clearly as possible when designing. According to his friend Maja, Movrin’s creativity is limitless – a continuous fountain of ideas that never cease. Laughing about her time working with him on the MA, she said it was not uncommon to receive a frantic text in the middle of the night with a new idea for them to get to work on the following day.